In this work, a novel combination of designed heat treatments and cold work performed on Al-6063 alloy was proposed. The consumption of aluminium and its alloys in the automotive and aeronautic industries has increased over the past few years, in the same way, as the consumption of material for manufacturing moulds for casting of plastic parts and dies for plastics and metals. Then, it is important to find a low-cost alternative to maximise the mechanical properties of aluminium, with a negligible effect on the ductility of the alloy, which is important due to thermal and mechanical fatigue on mould and dies. It is well known that precipitation hardening increases the mechanical and yield strength of aluminium alloys with a major ductility loss. However, the developed methodology consists of a solution heat treatment, followed by cold working (strain hardening), and lastly a heat treatment (precipitation hardening and stress reliever) to produce Al 6063 aluminium alloys with enhanced mechanical strength and with a negligible ductility loss. The proposed methodology increases around 23.45% of the tensile and yield strength, with a ductility reduction of less than 1.5% in the elastic materials region. The experimental tensile testing results are correlated with nanoindentation experimental results in order to confirm that the level of cold working is directly proportional to mechanical strength levels by two different characterisation techniques at a macro- and nanoscales, respectively. Funding was provided by Cátedras CONACYT and Sistema Nacional de Investigadores CONACYT by supporting researchers with the following ID numbers: 2309 and 5150. The authors acknowledge Dr. Juan Muñoz Saldaña head of CENAPROT for providing access to the mechanical properties laboratory facilities. The raw/processed data required to reproduce these findings cannot be shared at this time due to technical data protection. However, data will be available if requested by the readers. Polmear I, Light alloys: from traditional alloys to nanocrystals. Elsevier (2005). https://books.google.com.mx/books?hl=es&lr=&id=td0jD4it63cC&oi=fnd&pg=PP1&dq=Polmear+I+J,+in+light+alloy+(2005)&ots=pbq5u70Aqj&sig=izdQz-Cukk2klQfRx7t-giI4plA#v=onepage&q=Polmear%20I%20J%2C%20in%20light%20alloy%20(2005)&f=false. Grandfield J (Ed. ), Light Metals 2014. Springer (2016). https://books.google.com.mx/books?hl=es&lr=&id=GpXJDQAAQBAJ&oi=fnd&pg=PP1&dq=Grandfield+J,+Light+Metals+2014&ots=vlCW4iJ-ZZ&sig=lDYRedOxw5V-nsTRI3ewf3eP2qw#v=onepage&q=Grandfield%20J%2C%20Light%20Metals%202014&f=false. Giummarra C, Thomas B, and Rioja R J, in Proceedings of the light metals technology conference, vol 2007 (2007). http://morita1950.info/akio/data/Al-li%20Alloy.pdf. Cole G, and Sherman A M, Mater Charact 35 (1995) 3. https://www.sciencedirect.com/science/article/pii/1044580395000631. Accessed May 17 2018. Miller W, Zhuang L, Bottema J, Wittebrood A J, De Smet P, Haszler A, and Vieregge A, Mater Sci Eng A 280 (2000) 37. https://www.sciencedirect.com/science/article/pii/S092150939900653X. Accessed May 17 2018. Ozcelik B, Ozbay A, and Erhan D, Int Commun Heat Mass Transf 37 (2010) 1359. https://www.sciencedirect.com/science/article/pii/S0735193310001636. Accessed May 17 2018. Hodgson D, Wu M, and Biermann R, ASM Handbook, Volume 2, Properties and Selection, Nonferrous Alloys and Special-Purpose Materials (1990). https://scholar.google.com.mx/scholar?hl=es&as_sdt=0%2C5&q=ASM+Handbook+Volume+2%3A+Properties+and+Selection%3A+Nonferrous+Alloys+and+Special-Purpose+Materials&btnG. Accessed November 23 2018. ASTM, ASTM E8/E8M—15a: Standard Test Methods for Tension Testing of Metallic Materials, ASTM, West Conshohocken (2015) https://doi.org/10.1520/e0008_e0008m-15a. Babu P, Rao D, Rama Krishna L, and Sundararajan G, Surf Coat Technol 319 (2017) 394. https://www.sciencedirect.com/science/article/pii/S0257897217303651. Accessed May 28, 2018. Seal C, and Sherry A H, Procedia Struct Integr 2 (2016) 1668. https://www.sciencedirect.com/science/article/pii/S2452321616302220. Accessed May 28, 2018. Mukhopadhyay P, ISRN Metall (2012). 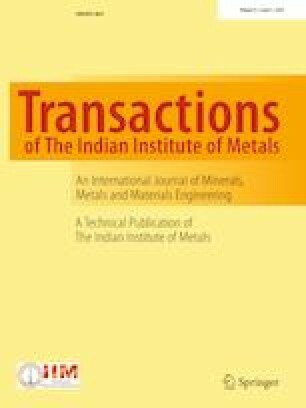 http://downloads.hindawi.com/journals/isrn.metallurgy/2012/165082.pdf. Accessed July 4, 2017. Ortiz D, Abdelshehid M, Dalton R, Soltero J, Clark R, Ortiz M, Dalton J, Clark R, Hahn M, Lee E, Lightell J, Stoyanov M, Hahn E, Lee W, Lightell J, Ogren P, Stoyanov O S, and Es-Said O S, J Mater Eng Perform 16 (2007) 515. https://doi.org/10.1007/s11665-007-9074-7. Butler J F, J Mech Phys Solids 10 (1962) 313. https://www.sciencedirect.com/science/article/pii/0022509662900030. Accessed May 18, 2018. Lomer W M, J Mech Phys Solids 1 (1952) 64. https://www.sciencedirect.com/science/article/pii/0022509652900070. Accessed May 18, 2018. Nagarajan S, Raghu N, and Venkatraman B, Mater Sci Eng A 561 (2013) 203. https://www.sciencedirect.com/science/article/pii/S0921509312015171. Accessed May 18, 2018. Van Rooyen G T, Mater Sci Eng 3 (1968) 105. https://www.sciencedirect.com/science/article/pii/0025541668900244. Accessed May 18, 2018. Prewo K, Li J, and Gensamer M, Metall Trans 3 (1972) 2261. https://link.springer.com/content/pdf/10.1007/BF02643241.pdf. Accessed May 18, 2018. Delwiche D, and Moon D W, Mater Sci Eng 7 (1971) 203. https://www.sciencedirect.com/science/article/pii/0025541671901467. Accessed May 18, 2018. Kyriakides S, J Appl Mech 67 645. http://appliedmechanics.asmedigitalcollection.asme.org/data/journals/jamcav/26501/645_1.pdf. Accessed May 18, 2018. Louche H, and Chrysochoos A, Mater Sci Eng 307 (2001) 15. https://www.sciencedirect.com/science/article/pii/S0921509300019754. Accessed May 18, 2018. Hadianfard M, Smerd R, Winkler S, and Worswick M, Mater Sci Eng A 492 (2008) 283. https://www.sciencedirect.com/science/article/pii/S0921509308003201. Accessed May 28, 2018. Cadoni E, Dotta M, Forni D, Bianchi S, in Performance, Protection and Strengthening of Structures under Extreme Loading, Trans Tech Publications (2011), p. 124. https://doi.org/10.4028/www.scientific.net/AMM.82.124. Naka T, and Yoshida F, J Mater Process Technol 89–90 (1999) 19. https://www.sciencedirect.com/science/article/pii/S0924013699000576. Accessed May 28, 2018.